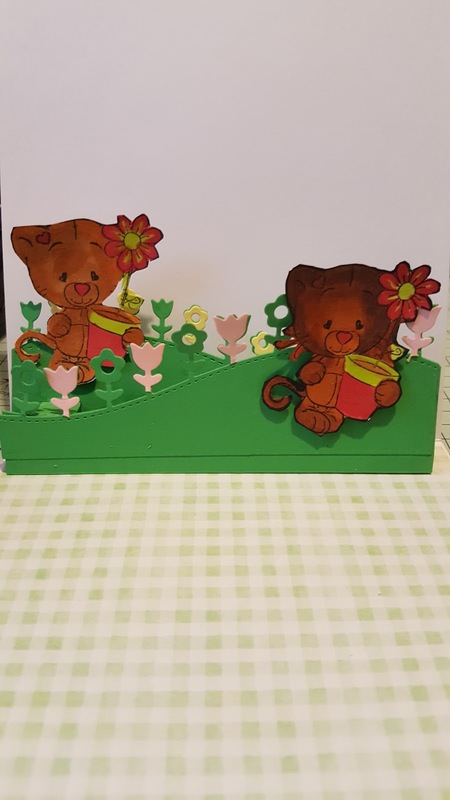 Hi to make the card firstly I did all the die cutting, I cut both dies out using green card stock, I then cut out both the flower dies again using green card stock. I then cut the flower dies again using pink and yellow cardstock. I paper pierced the flower dies using the pink and yellow flowers from the die cuts. I mated the front of my 6x6 card using a piece of rainbow card from my stash I also embossed the rainbow piece using an embossing folder also from my stash. I stamped, and coloured three bear images from a stamp set, I then fussy cut around them. I also cut a star using the rainbow card and I cut a white frame to go around the star, I then stuck the star on to my card and stuck one of the bear images on to it. I cut a happy birthday sentiment twice stuck one on top of the other and stuck this at the bottom of my card. 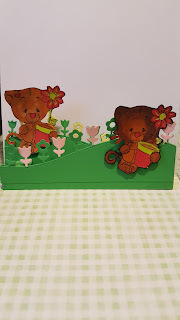 I the stuck all the hillside and flower pieces to my card and stuck the remaining two bear images on to the hills.